Horn of Africa map with 4 countries and their capitals, which are Djibouti, Eritrea, Ethiopia, and Somalia, and 10 neighboring countries. 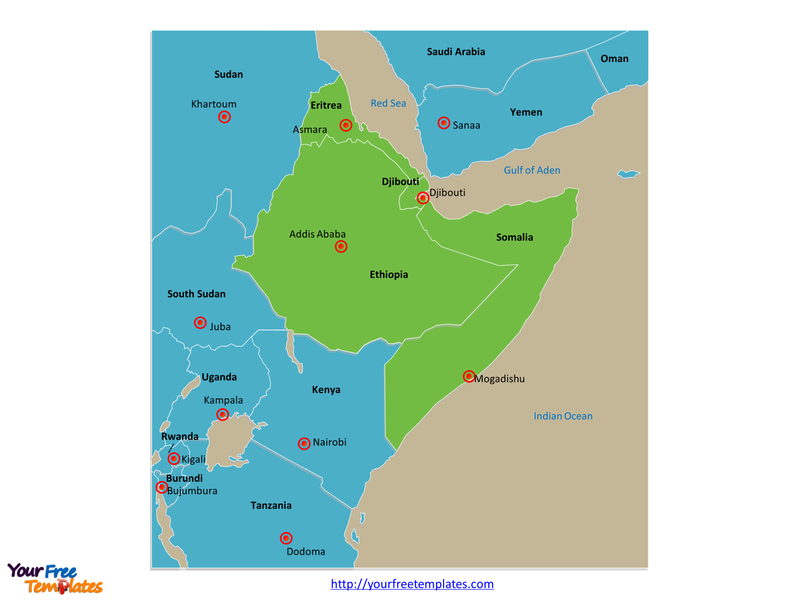 The Horn of Africa Map Template includes two slides. Slide 1, the Horn of Africa Map with countries. The Horn of Africa is a peninsula in Northeast Africa. It juts hundreds of kilometers into the Arabian Sea and Indian Ocean, lying along the southern side of the Gulf of Aden. The Horn of Africa denotes the region containing the countries of Djibouti, Eritrea, Ethiopia, and Somalia. There are also surrounding countries, namely, Sudan, South Sudan, Kenya, Rwanda, Tanzania, Burundi, Uganda, Saudi Arabia, Yemen and Oman. Slide 2,the Horn of Africa Map labeled with capitals. For the 4 countries in Horn of Africa region, their capitals are Djibouti; Asmara, Addis Ababa, and Mogadishu respectively, some capitals from neighboring countries are also labeled in this map.